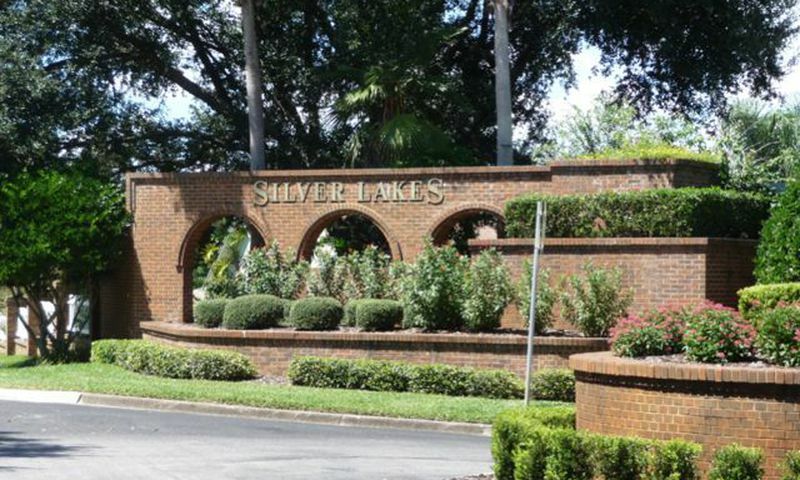 Silver Lakes is an established 55+ community in Lakeland, Florida. This gated community consists of 148 single-family homes available on a resale-only basis. Residents enjoy a quaint clubhouse with great amenities to stay socially and physically active. Located in Central Florida, Silver Lakes is surrounded by endless opportunities for recreation and entertainment. The clubhouse in Silver Lakes is the center for all activities in the community. Here, residents can work out in the exercise room, relax in the sauna, play a game of billiards with a neighbor or choose from one of the many titles in the library. Homeowners can also create projects in the arts and crafts studio, dance in the banquet room, or play cards in the multi-purpose room with other neighbors. Outside the clubhouse the amenities continue with an junior Olympic-sized outdoor pool and spa. The poolside patio offers a relaxing place to catch some rays under the Florida sun. Many residents often enjoy the walking and biking trails, which surround the scenic ponds in the community, offering another way to stay active. Silver Lakes was constructed between 1996 and 2001 offering 148 single-family homes available on a resale-only basis. Ranging in size from approximately 1,100 to 1,800 square feet of living space these homes offer two to three bedrooms, two to three bathrooms and an attached one to two-car garage. These homes provide the low-maintenance lifestyle and open floor plans that active adults prefer. Many of these homes offer covered lanais with great views of the scenic ponds. Living in Silver Lakes means not having to worry about tedious tasks around the house. An annual homeowners' association (HOA) fee covers general maintenance of the community grounds and clubhouse as well as lawn care and trash removal from all homes in the community. Residents enjoy this great low-maintenance lifestyle as it gives them the freedom to enjoy time with family and explore new hobbies. Those looking to connect with neighbors and friends can join any one of the numerous clubs and activities in the community such as fitness club, book club, cards, or dancing. Silver Lakes in Lakeland, Florida is surrounded by some of the best recreation and entertainment in Central Florida. Situated near I-4, Lakeland gets its name for the many freshwater lakes in the area offering great fishing, boating and water sports. Golfers will love the numerous public and private golf courses in the area with play for all skill levels. Residents of Silver Lakes never have to travel too far for daily conveniences as there is a myriad of options for shopping, dining, and medical services in the area. With all these amenities and conveniences located just outside the gates of Silver Lakes it's no wonder so many active adults choose to call this 55+ neighborhood home. There are plenty of activities available in Silver Lakes. Here is a sample of some of the clubs, activities and classes offered here. Homes in Silver Lakes range in size from approximately 1,100 to 1,800 square feet of living space with two to three bedrooms, two to three bathrooms and an attached one to two-car garage. These homes feature open floor plans and are low-maintenance, which are perfect for active adults. Many of these homes offer covered lanais with great views of the scenic ponds. Please Note: Floor plans are not available at this time. 55places.com is not affiliated with the developer(s) or homeowners association of Silver Lakes. The information you submit is distributed to a 55places.com Partner Agent, who is a licensed real estate agent. The information regarding Silver Lakes has not been verified or approved by the developer or homeowners association. Please verify all information prior to purchasing. 55places.com is not responsible for any errors regarding the information displayed on this website.